The notoriously gifted and adept independent journalist, Greg Palast, documents the political graft found inside our current electoral system and the myriad ways voter-suppression affected the outcome of the 2016 election in ways not fully covered by the mainstream media. 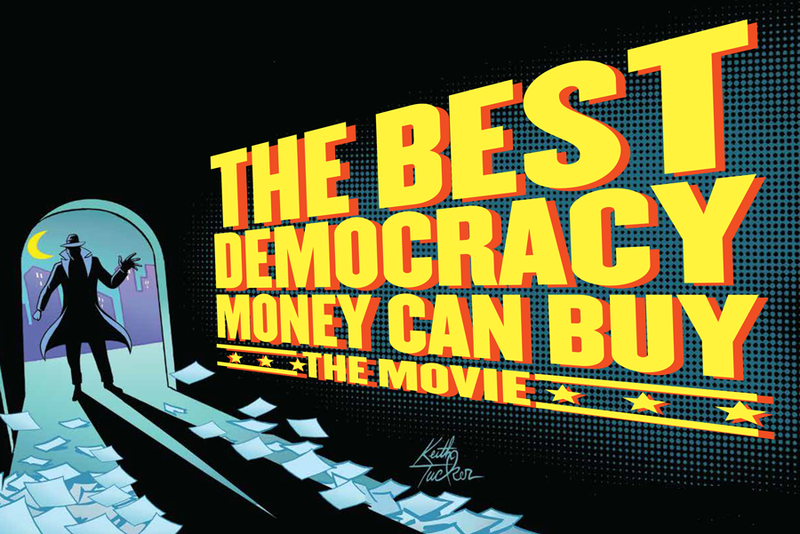 However, this documentary is also partly inspired by his deep-ranging book of investigative journalism: The Best Democracy Money Can Buy: An Investigative Reporter Exposes the Truth about Globalization, Corporate Cons, and High Finance Fraudsters (2002). As such, this documentary touches on all of those prior issues with gripping interviews and research showing the long, tragic line of money in politics as it extends to our more current and more aggressively fraudulent political system–where those who have the most campaign money speak the most, and relent the least, leaving the rest of America’s Post-Recession public shuffling, naked & hungry, through sage brush for their safe deposit boxes. When Donald Trump says, “This election is rigged”–he should know. His buddies rigged it. In Greg Palast’s 2004 film, The Bush Family Fortune, the Rolling Stone investigative journalist busted Jeb Bush for stealing the 2000 election by purging black voters from Florida’s electoral rolls (and no Ralph Nader was not to blame when Clinton voters in 1996 went to Bush in larger numbers than those voting for Nader). In the documentary, The Best Democracy Money Can Buy, the reporter goes deep into the mineshaft of the Republicans’ dark operation, “Crosscheck,” which was instrumental in stealing a million votes in the November 2016 election. Crosscheck is controlled by a Trump stooge, Kris Kobach, then Kansas Secretary of State, who still continues to claim his computer program identified 7.2 million people in 29 states who may have voted twice in the same election–a felony crime. The catch? The vast majority of these supposed “suspects” are minorities; or, in other words, they’re mainly “Democratic” voters. Yet the lists and the evidence remain “confidential.” Palast and his investigative partner Leni Badpenny do what it takes to get their hands on the data, analyzing it to find the names of nearly one million Americans who were about to lose their vote in November. Badpenny and Palast not only hunt down and confront Kobach with this new evidence (awkwardly at a BBQ), but they then interview the tragic victims of this scheme–all of whom were stripped from their constitutional right to vote. And so why talk about “DEM RUSSIANS,” when Greg Palast clearly documents how big money fueled an election rigging that is as open & obvious as an ocean to those willing to just look? Please Share & Care for Who Might Be Interested in Attending!